Retaining good employees is a critical part of a good workforce planning strategy. The cost of replacing an employee can be in the thousands of dollars in hiring and training costs. Employee departures can affect morale. Goodwill can customize a training program that helps your star employees feel engaged, valued and give them skills to do their job even better. Training isn’t just for new employees. Ongoing training has been proven to increase productivity, job satisfaction and can affect the bottom line. 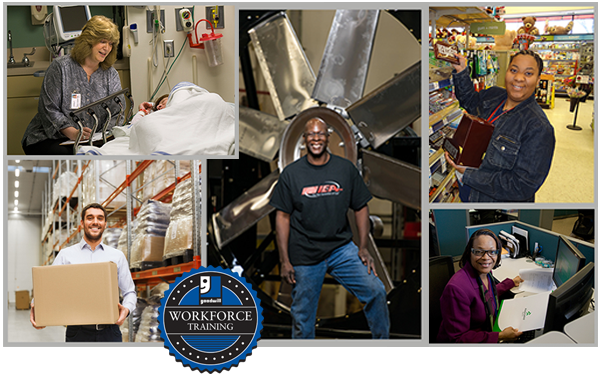 Goodwill works with organizations to develop employees in any area, strengthen performance and gain a competitive advantage. Your company may have some training in place already, or perhaps you are looking to formalize your training plan. In close collaboration with your team, Goodwill will design a training solution that can be embedded into your program and draw on the expertise of both organizations. Click on one of the case studies below to learn more about how Goodwill is helping companies achieve their business objectives through customized training. For more information, contact Michael Matus, Vice President Sales & Strategic Solutions, at (414) 847-4243 or michael.matus@goodwillsew.com. Businesses want to include a more diverse workforce as part of an overall human resources strategy, and Goodwill has found itself in high demand to help train and place people with disabilities in jobs. Learn more about our training solution. Like many companies in 2015, local banking saw drastic changes in the labor force, which had a significant impact on their industry. One local Wisconsin bank committed to creating a culture of learning in alignment with their values and providing the right tools for their associates to be successful. Ascension wanted to acquire and retain the best and brightest individuals, people who are self-starters and have a strong customer service attitude, for administrative positions like patient access and patient registration. For one local manufacturing company, the economic upturn resulted in increased growth and demand for their products. This company knew that higher numbers of contingent staff with no formal training could create onboarding challenges, high turnover, lower employee satisfaction and other issues.